This bushing is identical and from the same OEM supplier as our originals. I have successfully installed them in the forks from my '91 907ie with stock 17" wheels (and of course the longer version of the M1R). I have not verified if there is an equivalent for the lower bushing. These came from the part list for the BMW K1100LT. I would expect that the lower is the same, but the dealer didn't have any in stock to check. It is interesting that although the BMW fork looks so different externally and internally, it uses some of the same parts. I suspect it was made by Marzocchi as well. The identical OEM fork seal is also available from BMW. The Marzocchi part number is 528134. I paid $29 each from the same BMW dealer. Agree w Antti, good to know exactly. Maybe the excellent pics here could help? I'll pay those Beemer Boys a visit as I need new upper and lower guides in my front fork. The upper bushing is item #19 on page TAV20 of the '92 907ie parts manual available on this site. This correponds to Ducati #34910031A, Marzocchi part #538037 and BMW part #31422310347. This is NOT the dust scraper - item #15. The oil seal or fork seal (or "Junk Ring") is item #18 on the same drawing and corresponds to Ducati #93040051A, Marzocchi #528134 and BMW #31422312928. The Marzocchi numbers came right off the original parts. The Marzocchi manual covers a different version of the M1R and the parts diagram does not match the 907ie forks. 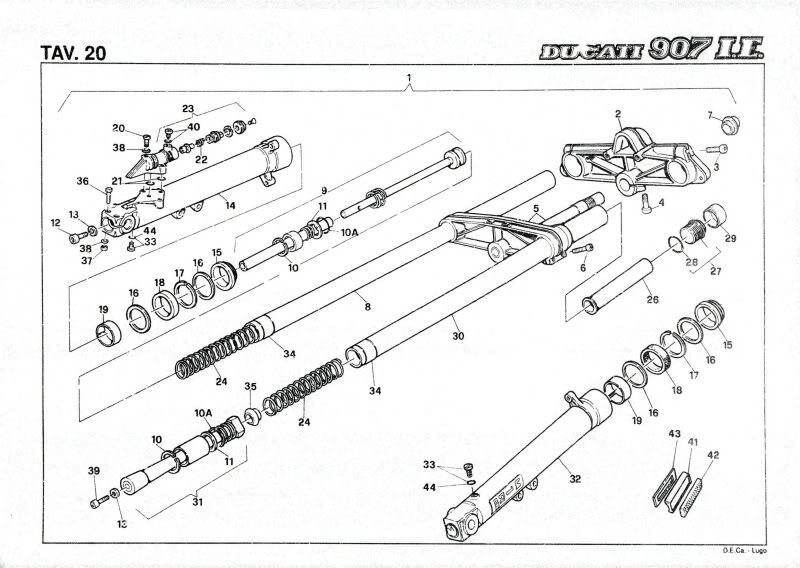 The proper diagram is in the Ducati parts book mentioned above. Please see also http://forums.ducatipaso.org/viewtopic.php?f=3&t=3378&start=15 for the photos of my forks. ...it is -5 deg C tonight. The seals and bushings are not shown in the photos because they have already been installed in the forks. Unfortunately, I didn't take the pictures before I started re-assembly. Let us know if the BMW parts are the same please! I did not research the lower bushings as mine were fine. Just a follow up on the parts for our M1R forks. I have identified and installed 2 more parts that are no longer available from Ducati. These are exact Marzocchi parts as used on both the BMW K1100LT and 907ie and are readily available through any BMW dealer. Last edited by pasolloyd on Thu Apr 28, 2011 1:29 am, edited 1 time in total. Just to re-iterate should there be any questions about the validity of the part numbers I have quoted in these posts. The parts described as sourced from BMW are not "like" or "similar to" or "kind of fit" substitutes. They are EXACT equivalents to the parts in the 907 ie forks and are manufactured by/for Marzocchi just like the ones used in our Ducatis. just discovered the BMW realoem-site where you can find all parts of cars and bikes. the lower bushings have partnumber 31422310346, where the upper bushing is part number 31422310347.
they are widely available. in the US at engelandmoto.com for instance. Thanks for the tip on the lower bushing. Looking forward to knowing if it is the equivalent to Ducati OEM like the upper one is. wow, these BMW partnumbers help. Just tried to order all the needed parts to rebuild the 907 fork. The junk ring is 41,7x55x7,5/10, but 41,7x55x8/10,5 fits as well! seem to be not available any longer. Stein-Dinse.de is not able to provide these any longer. #16 i got the last 2 available, #19 the last 1. When i disassembled my fork, #16 was installed only 1x per leg. The catalogue says 2x. The upper ring wasn`t in there. Somebody can tell me how it was with your forks?